Brad's Sound Company is the proud owner of an extensive range of Pro Audio equipment from QSC, Soundcraft, Peavey, Crown, Sennheiser, Yamaha plus many others. 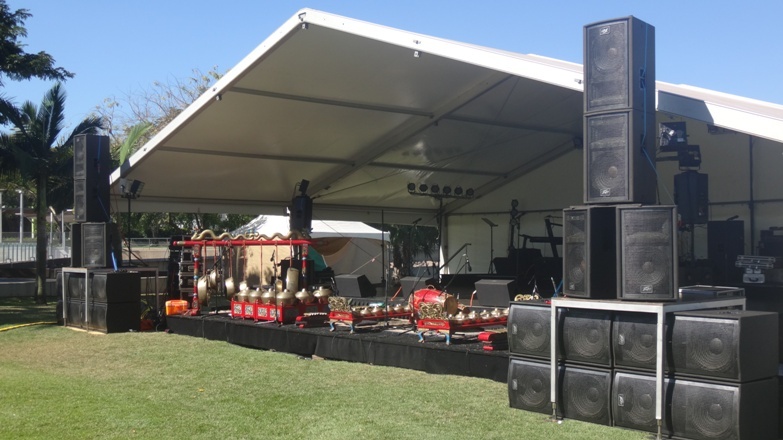 For small/medium venues we highly recommend our QSC loudspeaker systems. Our amplifiers are from Crown Audio and Peavey's legendary CS series. 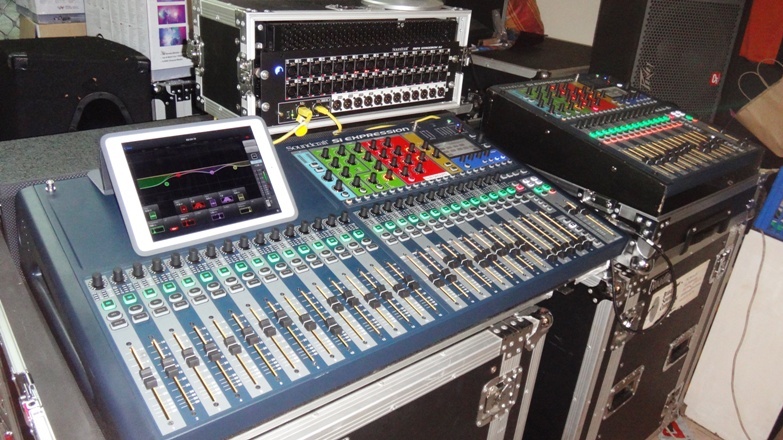 Our Analogue Sound consoles include Peavey 16Fx, 24Fx, 32FX, 6ch A&H and our main FOH console...the superb Yamaha IM8-32. When your event needs a monitor engineer we can supply a Soundcraft Monitor Spirit 2 with Violet Audio transformer isolated mic splitter boxes. Peavey also supplies our extensive range of graphic equalisers & compressors. We offer a very extensive range of microphones... featuring the world class Shure KSM9 condensers for discerning vocalists. For the ladies we have the superb AKG Elle C....tailored to suit the female voice. We have plenty of Audio Technica, AKG, Audix, & Sennheiser instrument mics....plus the superb Audix DP8 drum mics. For MCs, singers, actors we have an extensive range of wireless headsets & earsets. For acoustic guitars, bass, keyboards etc...we have plenty of active and passive DI boxes...in both stereo or mono. For monitor (foldback) speakers we offer up to six QSC KW122 plus 8 x Peavey SP15Ms. Top quality monitors rated at 1000watts program. Our digital FOH (front of house) and/or monitor sound consoles have the versatility for up to 14 seperate foldback mix sends to the stage. from up to 66 inputs. From 3000 people at an outdoor rock concert to a small wedding party....For community, School, cultural or corporate events.... DJ party music or spoken word...We supply first class equipment & service, whatever your requirements. 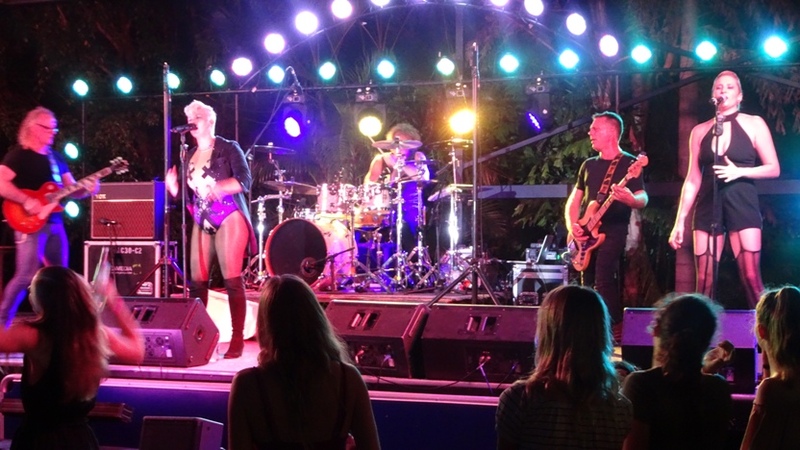 Our aim is simple....To provide Clear sound in any venue at the required volume levels for your audience....& to supply your performers & our sound engineers with the high standard of sound & stage equipment required to achieve this objective. 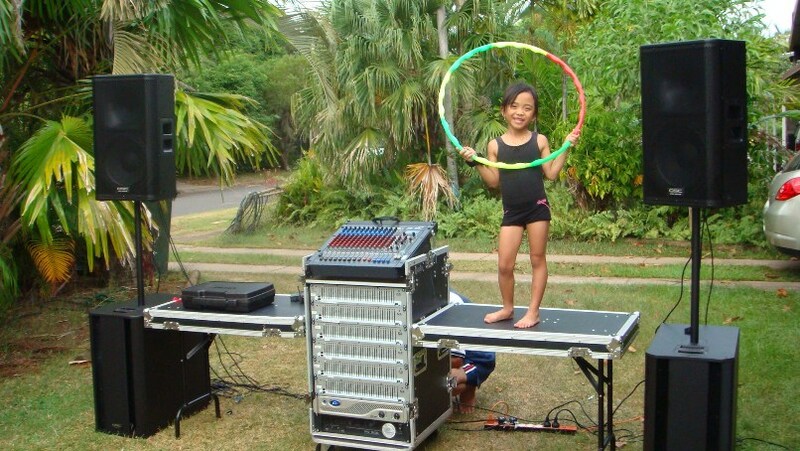 Our rates are very competitive & negotiable....special consideration is given for community & charitable events. Above: a 'Pink' tribute show with Brad's sound and lighting. Our service is based on the 'pursuit of excellence' ....in all facets of our work. We have provided production for many national and international acts... such as Jessica Mauboy, Angry Anderson, Justice Crew, Diesel, Becky Cole, The Radiators, Sara Storer, Mental as Anything, Thirsty Merc, The Giants, Spectrum, Bondi Cigars, Napathya (Nepal), Victoria band (Indonesia) plus many popular international and local acts. Brad's Sound Company are continually updating their equipment inventory with excellent audio and lighting gear from Soundcraft, QSC, Sennheiser, ADJ and Event Lighting. Above: All set for the Pesona Indonesia 2015 cultural festival..... 2,500+ people in attendance.